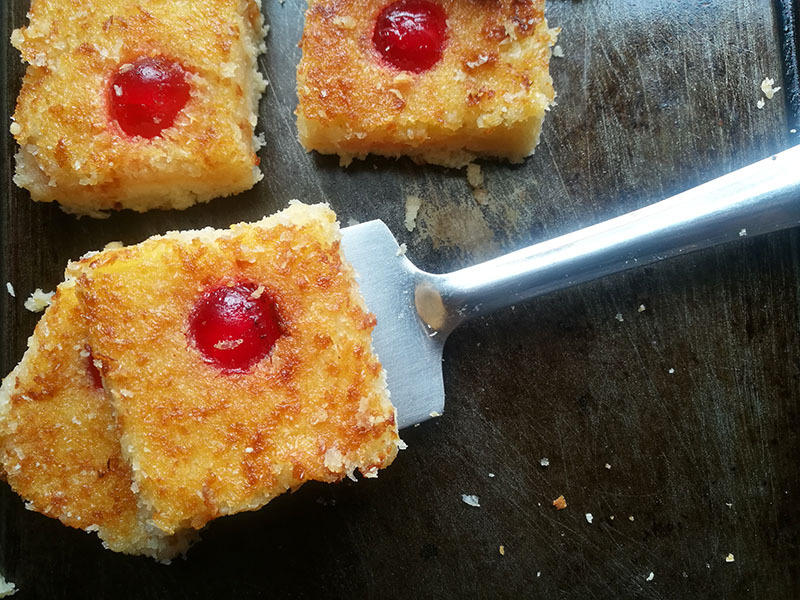 These Sweet Coconut Squares are a great make ahead traybake because they actually taste better a day or 2 after baking. If you love coconut bakes, then this one is definitely for you. Coconut mixture combined with a sugar syrup and layered on a buttery shortcrust base, easy and delicious. Traybakes are the best. They are quick easy and perfect for bake sales, parties or just for afternoon tea. Really portable, these treats can be baked sliced and served from the same tray as well. The amazing thing about these sweet coconut squares is that they taste better a day or 2 after baking, so it is a perfect make ahead bake. Just make sure that it is kept in an airtight container to keep it fresh. 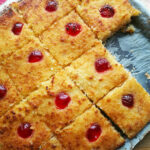 The base of this coconut squares is made up of a simple shortcrust pastry. Cold butter is rubbed into the flour mixture creating a soft dough. The dough is then refrigerated for 30 minutes. This makes it easier to roll or press out. These sweet coconut squares are best baked on a swiss roll / jelly roll pan. This is actually the best size pan for this bake. If it is any smaller, then the base and coconut layer will be too thick. Baked in a swiss roll / jelly roll pan creates that perfect base to coconut layer proportion. Start by making the shortcrust base. Combine the flour, sugar and baking powder. Using your fingertips, rub the cold butter well into the flour mixture until it resembles breadcrumbs. 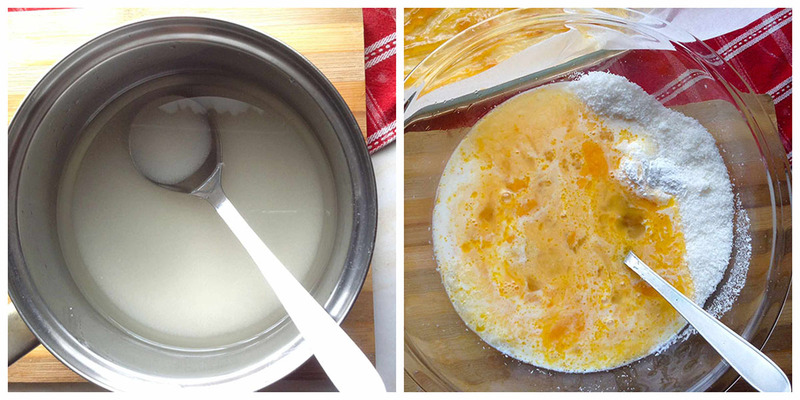 Add the iced water and beaten egg to the flour mixture and mix to form a soft dough. Place the dough in the refrigerator while you make the sweet coconut filling. For the coconut filling, combine the water and sugar in a small pan and place on the stove turned up to medium heat. Stir until the sugar has dissolved. Then allow the syrup to boil for 3 minutes without stirring.Remove from the heat and allow the syrup to cool for 5 minutes. Place the desiccated / shredded coconut in a large bowl. Stir in the cooled sugar syrup,beaten eggs, melted butter,vanilla extract, baking powder and milk. Preheat the oven to 356°F / 180°C. Line a 10×12 inch ( 25×30 cm ) swiss roll / jelly roll tin with parchment / baking paper extending over the sides of the pan. Press the shortcrust base evenly into the lined tin. The pressed shortcrust should be about 3mm thick covering the base of the tin. Brush apricot jam evenly over the pastry. To soften the jam so that is brushes easily, just place it into a bowl and pop it into the microwave for about 20 seconds. Be careful when taking the warmed jam out of the microwave, because it will be hot and can burn your hands. Spread the sweet coconut filling mix over the jam brushed base. 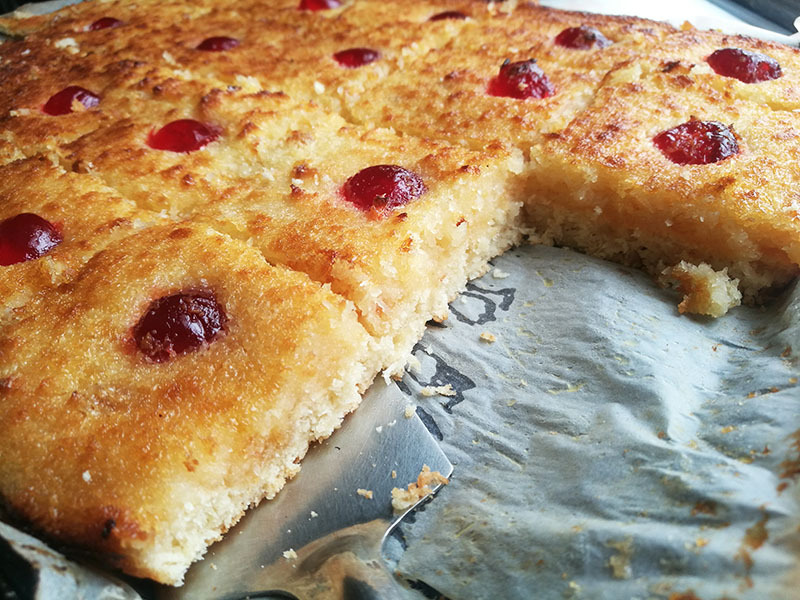 Place cherry halves over the coconut filling. Bake for between 25 to 30 minutes. Cool in the tin before slicing into squares. This is a real keeper of a recipe, whether you are baking for a party, get together, bake sale or just for yourself, this recipe does not disappoint. 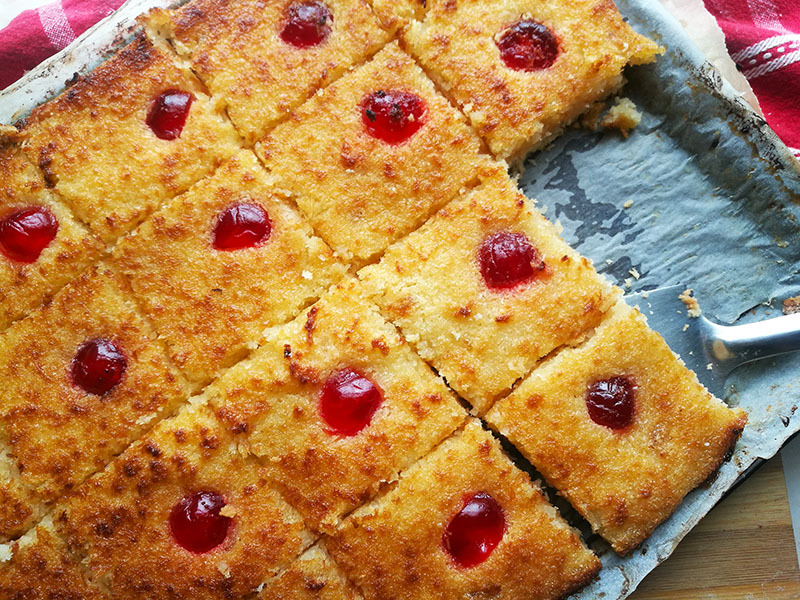 These Sweet Coconut Squares are a great make ahead traybake because they actually taste better a day or 2 after baking. 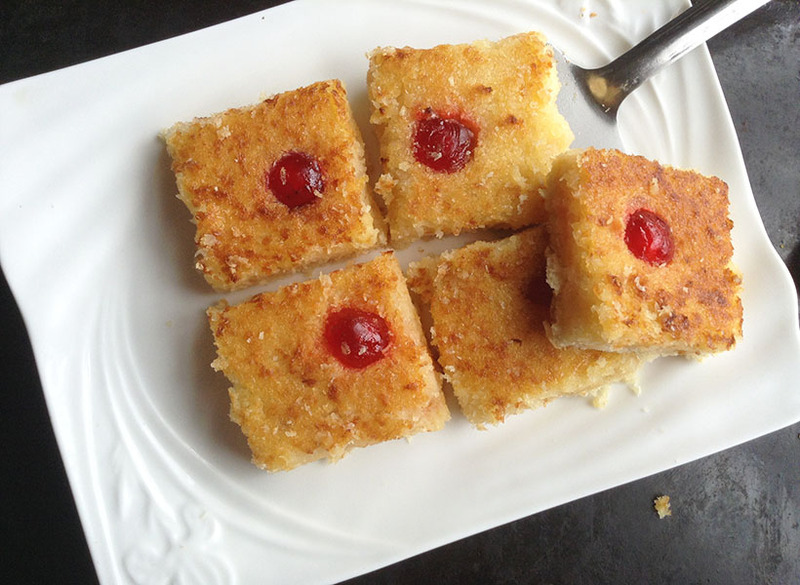 If you love coconut bakes, then this one is definitely for you. Coconut mixture combined with a sugar syrup and layered on a buttery shortcrust base, easy and delicious. Start by making the shortcrust base. Combine the flour, sugar and baking powder. Using your fingertips, rub the cold butter well into the flour mixture until it resembles breadcrumbs. For the coconut filling, combine the water and sugar in a small pan and place on the stove turned up to medium heat. Stir until the sugar has dissolved. Then allow the syrup to boil for 3 minutes without stirring. Remove from the heat and allow the syrup to cool for 5 minutes. Place the desiccated / shredded coconut in a large bowl. Stir in the cooled sugar syrup,beaten eggs, melted butter,vanilla extract, baking powder and milk. Preheat the oven to 356°F / 180°C. Line a 10x12 inch ( 25x30 cm ) swiss roll / jelly roll tin with parchment / baking paper extending over the sides of the pan. I loooove coconut! These sounds wonderful, Ashika! And I love the little pop of red from the cherries! I love all things coconut. Those little cherries on top are so cute, too! !